After last weekend's little mishap at Landahl, I was going to take it easy for a couple of weeks and put in some solid training. However, I remember on Thursday that I had signed up for the Crossroads Triathlon in Cameron, Missouri. I did this same event last year and had a great time, so with the money already spent I planned to head up Saturday morning and test the old legs. Not really the best training for an Ironman, but I planned to get there early and complete a good warm-up and cool down. Actually felt ver y good this morning. Something about 3 movements will do that to a person. This was a sprint triathlon, which takes an all out effort to do well. Not much pacing going on here for sure. Most of my training up until this point has been LSD, so I was unsure how I would handle it. I was seated in starting slot 24 - good old Jeff Gordon. I like him, so I was pumped and think this helped me have a solid swim. Even if Carolynn said I looked slow. That is because I am so darn smooth in the water. Just check out that form. Not bad for an old MX boy. I was out of the pool in 3:22 which is o.k. and I even caught my 15 second man. After a quick transition, I did my best cross mount and was speeding off out of the transition area. The old legs felt good on the bike. Especially the first 5 miles. I was hammering. Felt very strong and even bridged up and zipped past a couple of guys on some very sweet bikes. I always like passing those Cervelo's and such on the old Assisi. Hopefully I can get my own TT/Tri bike soon. Carolynn still has not gotten one for me and my bike fund is down to about $15.00.....finished the bike leg in about 21 minutes. I will have to see if this was the fastest of the day. I worked my way up to 3rd overall and based on my finish was leading the 40+ crowd. The final transition was one of my quickest ever. I was out in about 15 seconds. Very quick and smooth. I was actually proud of myself and even ran a quick first mile in 6:05. I actually felt like a triathlete and was hunting down 1st place overall. Then my ego left me and was replaced with a sudden very heavy feeling in my legs. This is the time to dig deep I said to myself. Carolynn was out riding around looking at all the guys in speedo's and took time to cheer me on. I kept the pace up until she was out of site then I could barely move the old legs. Some younger guy who started 30 seconds ahead of me (I had already passed him on the bike) passed me with a mile to go. I knew if I kept him in site that I would still beat him overall. I kind of felt like old Lance just marking him and making sure he did not get more than 15 ahead. The last bit of the run was downhill which really helped me and I finished strong in just over 41 minutes. Good enough for 1st place in the Male 40-44 division and 3rd place overall. I was happy with that time, especially because it was nearly two minutes faster that last years time. This past weekend we had awesome weather for July. Not often you see 60's/70's this time of year. Perfect weather you might say for someone like myself who is training for Ironman. Time to put in hours on the bike without killing oneself in the heat. Would have been a great day for the Farmhouse Classic. I signed up for it earlier this month. Completing 100 miles of gravel will make you a stronger person when it comes time to dig deep during events like the Redman. But what do I do? I end up taking my family to ride some sweet dirt out at Landahl Park and ride with some friends. Carolynn and Christopher wanted to go ride so I bailed on the long ride and decided at the last minute to switch my plans and bring out the old MTB. So I go ahead and make plans to ride Saturday at Landahl then either race the Cramp Alexander MTB race or the SMSG Triathlon on Sunday. All fun events, but not great training for an Ironman. Sometimes fate steps in and lets you know you are not going down the right path. Saturday I was reminded that I need to get my focus back on training for my triathlon. While leading our little group heading down Rim Job (before you ask Jackie, this is trail out at Landahl...) I decided to try and ride under a fallen tree. There appeared to be enough room to make it at speed, but what I did not know is that a large branch of this tree was hidden by the leaves. I smacked right into the branch, which nearly knocked me off my bike. It "stung" a little and caused me to see stars, but I didn't say much about it and kept on riding. The trails were in too good of shape not to be riding. After about 15 minutes I started to feel better, but my balance and nerves were way off. After a great ride (not counting the hitting the tree), we went to Back Yard Burger, which is one of Christopher's favorite places. BYB might actually be the only reason he came riding with us, but that is another story in itself. It was at this time that I started to feel the effects from hitting the tree. I started getting nauseous, a bit confused and a nasty headache developed. Well, I've hit my head dozen's of times and have been knocked unconscious (mostly from motorcross) more times that I can count. Not much you can do but rest so that is what I did. 59 days. That is how long we have to wait until the wacky world of cyclocross starts around here. The Bearcat Cross over in Hermann starts things off this year. Things kick off here in Kansas City big time with the start of the De Stad Cyclocross Van Kansas Series . First round will be the very popular Diamond Blackfan Cyclocross Challange. My good friend Tige Lamb is again hosting this fine event with help from his Cow Town team and this guy. Breaking news!!! For round # 2 things move to a new location. The great City of Independence, home of Harry S. Truman, will host its first cyclocross race on October 11, 2009. After months of hard work by myself, Richard, Ashly and Matthew of the Independence parks department, we finally got approval to use this sweet new park. Rich is busy working on designing a course. Oh, did I mention that Richard Anderson is taking over the famous Chris Cross event. I have kind of a theme going here. First two events and I am not the race director. Sounds good to me. Time to pay appreciation to all the Cows in the world. 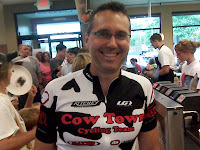 Today Chick-fil-A is hosting the 5th Annual Cow Appreciation Day. 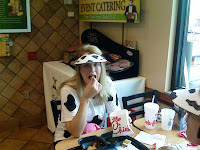 were you receive a free meal if you come dressed as a Cow. I was really surprised by how many people were dressed up for this fine event. I think I won the contest today. I had the best outfit hands down. What do yo think? As I pedaled along Hwy 210 on a 5 hour ride yesterday, I yelled out "what the hell was I thinking?" Here I am, injured (Bilateral IT Band Tendinitis) with instructions from my Doctor and PT to rest. But who can rest when they have an Ironman triathlon to train for. Only 74 more days until the Redman. Yea, I rested for a week. Even hit the lake for a couple days with the family. Tige invited us to come on down for a two days of lake fun. 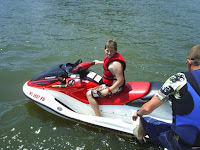 Christopher got to ride a Honda Wave Runner. He was a little timid at first, but after awhile he got his balance and some confidence. He actually got going over 40 mph on it. Not as fast has my 62 mph, but still fast. After 4 visits to the PT clinic, I am starting to get convinced that they do not know what they are doing. They have only shown me 2 exercises/stretches to do. The remainder of the time they talk and ask questions. They just want me to rest. Well, I can tell you that resting did not help any. They did video tape me running to see if that has caused the problem. After laughing at me for 30 minutes and telling me that my hips look funny (wiggle to much) and that I over-pronate on the left side only. Well, it is my right knee that is causing me the most problems. They did not seem to hear that. Anyone know of a sports specific PT clinic that I could go to? Training for an Ironman distance event takes an incredible amount of time and commitment. For some reason I am compelled to complete another one. Why, God only knows. I am thankful that my family is supporting me on this endeavor. Christopher even followed me on his bike last week hauling extra water for me. I hope he is ready for a lot more run/rides. I need both Carolynn's and Christopher's help if I am going to reach my goal.